At Mobile Horse Racing our goal is to find you the best horse racing apps for betting, tipping, live streams, racing news and more. These are the best iOS, Android, Windows Phone & Blackberry apps for racing fans. Racing fans now have access to a huge array of racing related apps for their smartphones and tablets. It is now possible to watch every horse race from the United Kingdom, USA, Ireland, South Africa and Australia live on your iPhone or Android. Punters can take advantage of betting tips from industry insiders and place bets on the go. Many free apps offer detailed racecards, form guides, news, results, statistics, live streaming, commentary and much more. Here is our essential guide to the very best horse racing apps for iPhone, iPad, iPad Mini, Android, Windows Phone and Blackberry phones and tablets. Choose from a variety of live streaming apps for smartphones and tablets that will allow you to watch every horse race from the U.K., Ireland, Australia, South Africa, South American, France, Dubai and the United States live on iPhone, Android, Blackberry & more. Improve your chances of beating the bookies by using any of these free betting advice and tipping apps for Android and iOS devices. Get your winning daily naps from a selection of top tipsters and journalists at leading horse racing publications. Keep up-to-date with the latest horse racing developments with these racing news apps for iOS, Android and more. These apps also offer in-depth form guides, statistics, racecards, insider knowledge, betting odds, commentary, race predictions and much more. We've put together a comprehensive list of every free racecourse app, including Cheltenham, Ascot, Doncaster, Chester, Epsom Downs, Haydock, Newmarket, York, Sandown, Churchill Downs, Worcester Racecourse and many others. Our racing videos section features video demonstrations of many of the apps reviewed on this site. Watch a selection of videos of tipping, racing form, news, racecard, racing results and racecourse apps. Subscribe to our YouTube Channel to receive regular updates. The world of mobile gambling is changing rapidly. As smartphones becomes more powerful, better and more sophisticated apps are being released every week for horse racing enthusiasts. Our blog offers news, discussion, articles, analysis and more. Can I legally watch live horse racing on my phone or tablet? Yes, there are a number of apps that offer live streams of horse racing from the United Kingdom, Ireland, South Africa, Australia and the United States. Some of these apps are free to view, while others are subscription based. 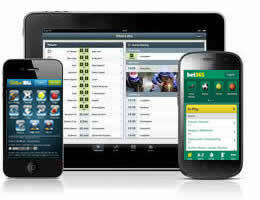 Our Live Horse Racing section lists each of these apps in a little more detail. Why can't I find any bookmaker apps in Google Play (Android Market)? Google no longer permits real money gambling apps in Google Play. Many online bookmakers offer installable apk files that can be downloaded directly from their website. Alternatively, Android users can install web apps via the Chrome browser, which are indistinguishable from native apps. These restrictions only apply to apps that offer a real money gambling service, so if you just want to download an app for racecards and form, racing results, live streams or betting tips you shouldn't have any problem finding them in Google Play. Are there any bitcoin racebook apps for betting on horse racing? The crypto-currency bitcoin is changing the way we gamble online. There are now many bitcoin sports betting apps that allow you to wager with BTC. I use a BlackBerry / Windows Phone. Can I still use these horse racing apps? That varies from app to app. While only a select few bookmakers offers native apps that can be downloaded from the BlackBerry App World or Window Phone app store, all of them offer mobile optimized sites that are exactly the same as the iTunes App Store and Google Play versions. Can I bet on horse races from my phone in the United States? If you are a citizen of the U.S.A. then you will not be able to wager via any of the big European bookmakers like Bet365, William Hill or Paddy Power. Thankfully there are a number reliable and secure racebooks that cater for U.S. racing fans. Check out our U.S. Racebooks section for a full run down. Are there any good apps for horse racing tips that will help me win money? Yes, most definitely there are a number of apps that will improve your chances of winning money. Our Tipping Apps section provides a guide to the best betting advice apps we've found so far. You can either choose to take your advice from racing experts or rely instead on computer algorithms that use the racing form to predict the outcome of every race.